As noted above, the book stands on its photographic content. It is lavishly illustrated. There are some drawings which add valuable detail, but illustration is mainly photographic and predominantly in full colour. It is a visual treat and provided at an extremely aggressive low price. Good gloss paper stock has been used and this results in pin-sharp images that are well-lit. If you can’t visit the ship on the Thames, you must buy this book. 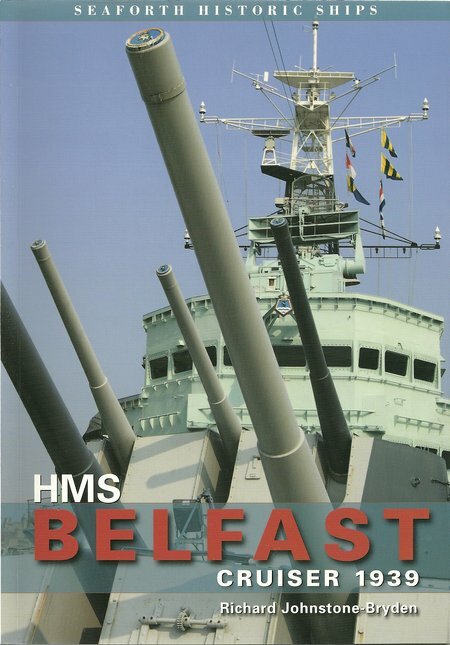 If you do intend to visit HMS Belfast, this book provides an excellent primer to make the best of your visit. DESCRIPTION: After building many thousands of warships since King Alfred established the first standing naval force to fight the Viking raids on Saxon England, only three major warships have been preserved. The Mary Rose has been raised and her remains preserved at Portsmouth in the same heritage area that Nelson’s HMS Victory is preserved. Both can claim to be line-of-battleships. The third major warship is HMS Belfast, which can claim to be a big gun warship but is classed as a light cruiser, one of ten Town Class cruisers. Not one post Dreadnought battleship or battle cruiser has survived into preservation. That is a sad indictment of the British ability to preserve examples of technology that led the world and served with the mightiest navy, unchallenged for 100 years. The indecent haste with which RN aircraft carriers were rushed off to the scrap yard has been matched only by the sheer vandalism where a fleet of new Nimrod maritime patrol aircraft were paid for by the taxpayer and then turned into scrap before entering service. This national lack of resolve in preserving major ships, civil and naval, should not detract from the many fine museums and heritage sites around the British Isles that take great care, mostly with volunteer workers and local fund raising, to preserve some fine examples of Britain’s maritime past. However, large warships and liners require firm political commitment, at least to get the preservation project started. That HMS Belfast looks every part a capital ship is because she is displayed alone. This makes her look larger than she really is and her bristling armament of turret-mounted guns looks more powerful than she really is. She plays the part of a battleship and looks magnificent. Even so, it is amazing that Britain has been unable to preserve a battleship and an aircraft carrier. The fine exhibits of the restored SS Great Britain and the Clipper Cutty Sark provide some preservation of the merchant marine that made the British Empire possible, but there has been a failure to preserve a single great Liner, with other countries taking up the baton and preserving great British liners. HMS Belfast very nearly ended up as scrap, but has become a cherished exhibit on the Thames, across from the Tower of London and just upriver of Tower Bridge. She has become a major tourist attraction and not just for naval enthusiasts. Her benefit is beyond the money she may directly take, because she is part of the range of attractions that makes London a major tourist destination and brings considerable funds into the London economy. In fact the income generated around the country by heritage sites and exhibits demonstrates their ability to pull in more money than they cost to maintain. In the case of HMS Belfast, it has been claimed in the past that for every visitor who steps aboard, 30 view her from the opposite side of the Thames, and many more view her from the tour boats that ply the Thames. That may suggest a need to improve access, but it also demonstrates the pulling power of a great ship. The author has returned to writing books after a lengthy break, although he has continued to write for leading international magazines between books. His first published article, for Motor Boat and Yachting, provided a brief history of restored Motor Torpedo Boat MTB102, on which he served for two years as a member of the permanent crew. From there, he wrote for an increasing number of magazines on a range of subjects, but primarily on naval history, wooden boat building and maintenance, and yachting. His first book was the definitive “HMS Ark Royal” (VI), followed by the Official History of “HMY Britannia”. He also wrote a history of the unique heritage yard and fleet of traditional Broads sailing cruisers, “Hunters Fleet”, and a book covering the surviving examples of the Broads sailing Wherry. This new book provides a well-researched history of HMS Belfast and marks a return to writing books. HMS Belfast was appropriately built in the Belfast yard of Harland & Wolff and was accepted by the Royal Navy only weeks before the outbreak of World War Two. She was one of the last of a line of armoured steam cruisers built for the Royal Navy, although three Lion Class cruisers were laid down later and arguably warships classed as destroyers or frigates are similar in size to cruisers and had similar capabilities. The Town Class ships were designed before the advent of radar and were accordingly equipped with a catapult and Walrus biplane amphibian to scout ahead of the cruiser and direct gunfire. There is a rare photograph in the book of a USN HO35-1 helicopter landing on the quarterdeck of HMS Belfast during the Korean War. Town Class cruisers did participate in helicopter trials with early Hoverfly helicopters and the later S51 Dragonfly, but they never embarked helicopters. Landing and take-off required the Y turret to be trained abeam with the ensign staff and guard rails lowered. The Walrus and catapult were deleted during WWII because Belfast was by then equipped with effective radar for navigation and gunnery control, leaving space to relocate the ship’s boats and retaining an electric aircraft crane to simplify launching the boats. HMS Belfast is perhaps best known for her part in the sinking of the German battle cruiser Scharnhorst, but she was involved in many other actions. She had three distinct periods of service before becoming a preserved exhibit on the Thames. During WWII, she served principally in the Northern Atlantic and on Arctic Convoys where the major enemy was most frequently the weather and appalling sea conditions. With the German threat diminishing after the D-Day landings of June 1944, during which Belfast was part of the shore bombardment force on the Eastern side of the beachhead, she was refitted and prepared for service in the Pacific. In the event, she arrived too late as Japan surrendered after the US nuclear attacks on the Japanese home islands. However, Belfast was to make the Pacific her home after 1945 and justified her mid life refit through the need for a small number of cruisers to serve as flagships, in her case in the Far East. From 1945 – 1950, she was engaged in peace keeping duties in Far East waters as China’s civil war ended with victory for the Communists and an increasing threat to British interests in the area. When the Korean War began in 1950, Belfast was an obvious choice for inclusion in the British naval force supporting the UN forces. After the 1952 Armistice, Belfast returned to British waters and a bleak future, most probably destined for the scrap yard. In the event, a shortage of suitable warships to act as Flag Ships was to secure for her a refit and modernization that considerably altered her appearance and utility. The deletion of the torpedo tubes reduced top weight and provided more space. The AAA armament was changed to 40mm Bofors guns, an enclosed bridge built, and a lattice mast installed to better support the contemporary radar and communications antennae. In this form, she served from 1959 – 1961 as a Far East Flag Ship, before serving her final years as an accommodation vessel. It was a close run thing for her to be selected for preservation. Fortunately luck was with her and she became the sole example of a major Twentieth Century warship to be preserved in Britain. The author has covered this history concisely and the text is supported by a good selection of images from various sources. This service history and an account of the decisions to save the ship from the scrap yard form the Introduction to the book. Following the introduction, the book is mainly provided with text in the form of photo captions. What makes the book are the outstanding images and the book is primarily dedicated to HMS Belfast in preservation. A great many of the images have been shot by the author who is as well-know as a photographer, as an author. Ten chapters provide a detailed description of the parts of the ship, the work of preservation and recommended further reading. The author has started at the Hull, before working through from the Forecastle, the Main Armament, Forward Superstructure, Amidships, Aft Superstructure, accommodation – Life On Board, and Inner Workings, concluding with Conservation and Further Reading.